The independent research firm TechValidate has conducted a number of surveys with small-, medium- and large-sized organizations from a variety of sectors about their migration to PrinterLogic—often with persuasive results. Recently TechValidate asked members of a K-12 school district about their experience after installing PrinterLogic (TVID: A1F-D90-77A) and arrived at statistics and outcomes that offer real-world proof of PrinterLogic’s power, versatility and efficiency. Prior to installing PrinterLogic, this school district had trouble with end-user printer installation in its 50+ printer environment. Teachers and administrators frequently had to place calls to the service desk in order to carry out routine installations. It was also difficult for IT staff to manage drivers for the physical printers located at multiple sites across the district. After PrinterLogic, it was a different story. The time spent on print management, the number of print-related service desk calls, and the remote server infrastructure were all slashed by 70%. That equated to significant cost savings. 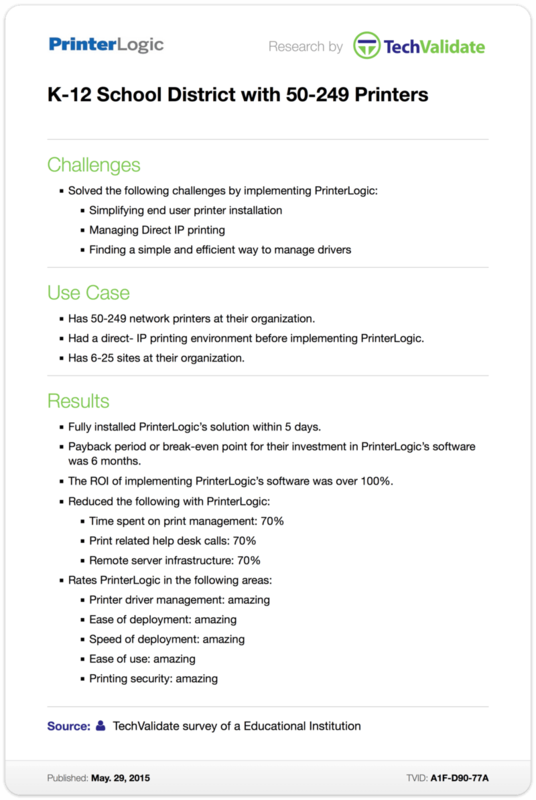 Within six months, PrinterLogic software had paid for itself, and the district has already seen ROI of more than 100% since implementing PrinterLogic. And the school district started seeing results almost immediately. Complete installation of PrinterLogic only took the entire organization five days. In other words, this K-12 school district gave PrinterLogic a glowing report card. No wonder our enterprise print management solution consistently ranks best in class.